All cameras require a lens and an interchangeable lens camera requires a mount for attaching the lens and providing communication between the two, at least in the case of modern camera systems with autofocus and electronic aperture control technologies. So why should a photographer care about the specific technologies utilized by their lenses and camera lens mount? The performance of a lens and its mount significantly impacts the quality of imagery delivered by a camera system. 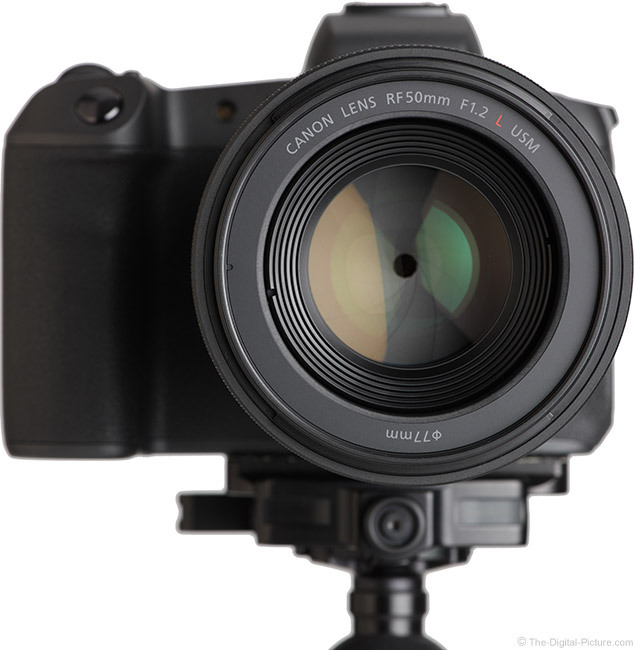 Why did Canon create the RF mount with the R-series cameras? 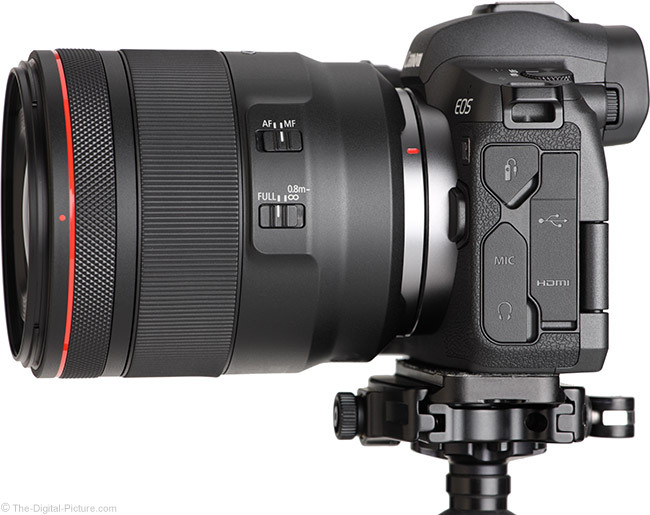 Thirty years after introducing EOS cameras and their associated EF (Electronic Focusing) lens mount, Canon continues to introduce new high-end EF lenses and new EF lenses are expected to be released long into the foreseeable future. 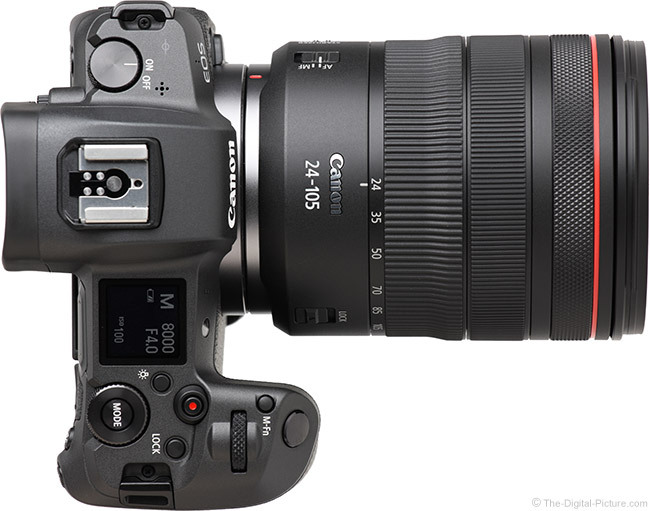 However, in those last three decades, significant technological advancements, especially computer-driven advancements in camera/lens design and in the technologies available for in-camera processing, have been realized. One of those advanced technologies is fast imaging sensor-based autofocus. Performance of Canon's Dual Pixel CMOS AF system, utilizing an AF-contributing dual photodiode structure in each photosite providing, initially in the R-series, 87 selectable positions horizontally (covering 88% of the image width) and 65 selectable positions vertically (covering 100% of the image height) for up to 5,655 manually selectable AF points, along with the latest DIGIC processors (version 8 implemented in the debuting EOS R), has increased to the point where the conventional mirror assembly and its associated AF system can be completely eliminated. Eliminate the mirror assembly and the TTL (Through the Lens) optical viewfinder is no longer feasible and replaced by an EVF (Electronic Viewfinder). I'll leave the Electronic vs. Optical Viewfinder Comparison for another page, but key is that, with the mirror assembly out of the way, the lens mount can be moved much closer to the imaging sensor and this change has benefits. Canon's full frame implementation of the latest technologies delivered the RF Mount. The RF lens mount retains the large 54mm inner diameter advantage of the EF mount (for reference, the Nikon Z mount has a similar 55mm diameter, the Nikon F-mount is only 44mm and the Sony E mount is 46.1mm). While retaining the rigidity/durability/strength and ultra-wide aperture support the large diameter mount provides, reducing the flange back distance (distance from the back of the lens' mount to the imaging sensor) from 44mm to 20mm (Nikon Z is 16mm and Sony FE is 18mm) supports new optical designs that are potentially smaller and often include large diameter rear-positioned elements. The now-enabled larger rear-element optical design can feature reduced angle of light rays in the image circle periphery and bending light to a lesser degree can lead to improved image quality, especially with better-corrected aberrations. The larger rear-element design of RF lenses also lends to a comfortable shape and weight balance. Improved communications is a critical part of the RF mount design. Along with a new microprocessor in the lens, the RF mount implements a 12-pin connection between the camera and the lens, a 50% increase over the 8 pins found on the EF mount. Along with more data channels, the new design provides higher speed data transfer for extremely fast AF, enhanced image stabilization and image quality optimization. Lens-camera communicated data is also utilized for the in-camera DLO (Digital Lens Optimizer) feature. Increased built-in memory capacity allows more data, including aberration correction data, to be stored in-lens for precise image correction (though most of us would of course prefer no corrections be needed). Note that DLO data from compatible EF and EF-S lenses is pre-stored in EOS R-series cameras. 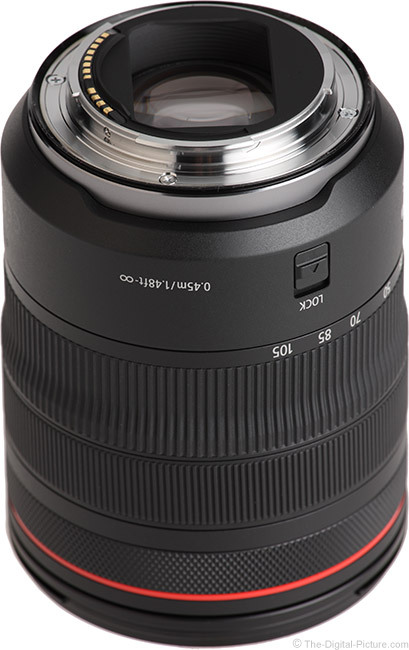 A critical RF mount design requirement for Canon's engineers was that EF lenses must be supported. Designed for a longer flange back distance, EF lenses must be shifted forward 24mm to function properly. 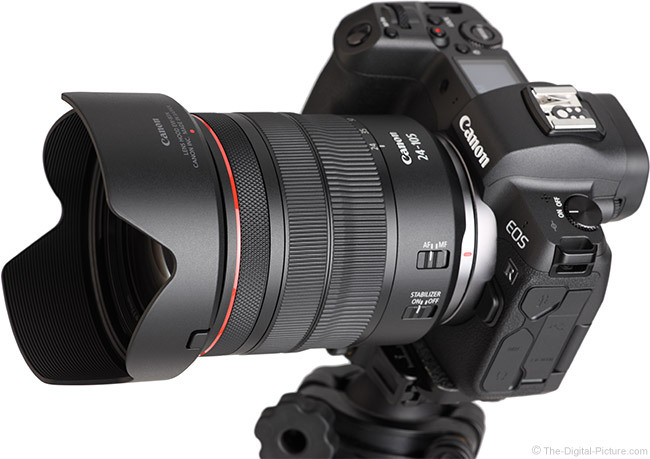 The optic-less Canon Mount Adapter EF-EOS R, available in a variety of designs from simple and inexpensive to options including control rings or drop-in filters (yes, you can now add a small circular polarizer filter to your Canon EF 11-24mm f/4L USM Lens or Canon TS-E 17mm f/4L Tilt-Shift Lens), provides that function, converting the EF 8-pin communications to the new 12-pin design while incurring practically no performance compromises. While the need to use an adapter may not be preferred over using a native mount lens, the advantages of the much shorter flange back distance warranted the decision to go with an adapted solution. That all EF, TS-E, MP-E and EF-S lenses are supported by the RF mount is excellent, facilitating the incorporation of an RF-mount camera into an existing Canon kit. While EF-S lens are not typically optimal for full frame cameras, the adapter accepts these lenses and the R-series cameras automatically switch to crop mode with such in use. Missing on the supported lens list is the EF-M series. Having a 2mm shorter flange back distance, 18mm vs. 20mm, is a definite challenge for EF-M to RF adapter design and it seems unlikely that we are going to see such an adapter become available. Making use of RF mount-facilitated capabilities is the addition of a knurled control ring on RF lenses. This ring can be programmed to control Av, Tv, ISO or +/- EV (with more options coming) with or without a shutter release half-press required (for a locked setting) and the adjustment direction can be reversed. 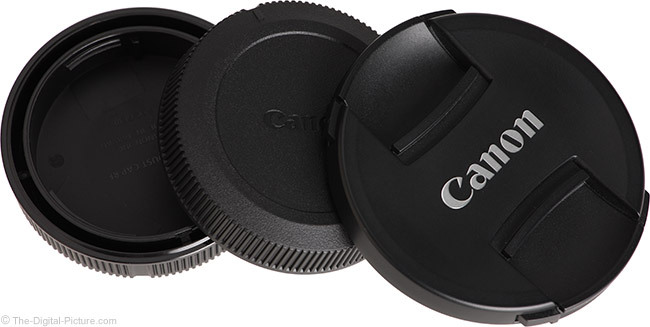 While the control ring arrives clicked from the factory (audible in camera-mounted audio recording), Canon Service can remove the clicking mechanism (for a fee). I initially found it easy to confuse the control ring with the manual focus ring, but a little tactile training resolves this issue and this feature can improve speed in the field. The RF mount uses a 3-tab bayonet design, just like the EF mount. While the two designs are similar, the tabs are positioned so that lenses cannot be inadvertently mounted on non-compatible cameras. Along with a new mount come new lens and body caps and the RF caps unsurprisingly sport a more-modern appearance than the older EF models. 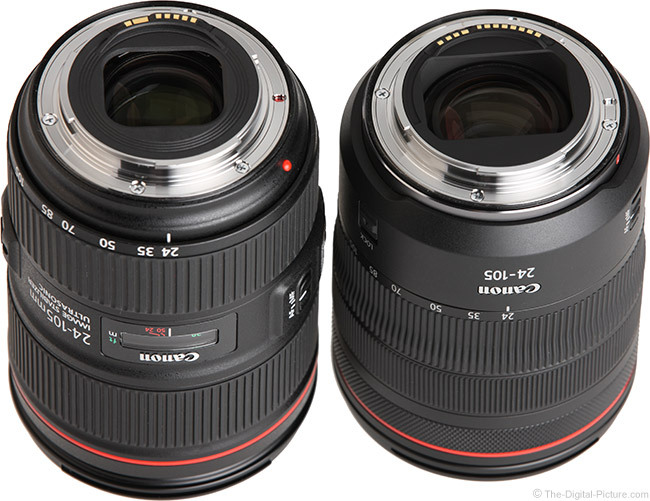 Both of the RF caps are slightly wider than the respective EF caps with the lens mount cap receiving a more substantial upgrade, featuring a robust double wall design. Modestly annoying is that the RF caps mount in only a single orientation vs. the EF caps' three, requiring a bit more care when installing the cap. RF mount and body caps fit EF models, but the RF bayonet mount tab positions preclude EF mount and body caps from mounting on RF lenses. If moving to the RF lens system, consider adding some spare body and lens mount caps to your kit. RF front lens caps, as shown above beside a pair of RF lens mount caps, remain unchanged from current EF front caps that were very nicely modernized not to so long ago. RF lenses utilize electronic manual focusing (focus-by-wire). The focus ring is not physically connected to focusing optics, but when turned, the lens is instructed to adjust the focus distance via a tiny, fast and practically silent motor. Electronic manual focus lenses can, and often do, implement a variable speed focus drive. Turn the lens slowly and focus distances change slowly, ideal for precise focusing at even close distances. Turn the ring fast and long focus distance changes can be rapidly made. While a variable speed focus ring has advantages if implemented well, I usually find them quite frustrating. So, I was more than a little excited when I discovered the R-series menu option for selecting between fixed and variable speed manual focusing rates ("RF lens MF focus ring sensitivity"). Another interesting menu option is the ability to change the direction of the MF ring and, as previously mentioned, the control ring also has the same option. RF lenses, at least those initially-introduced, do not have focus distance windows. 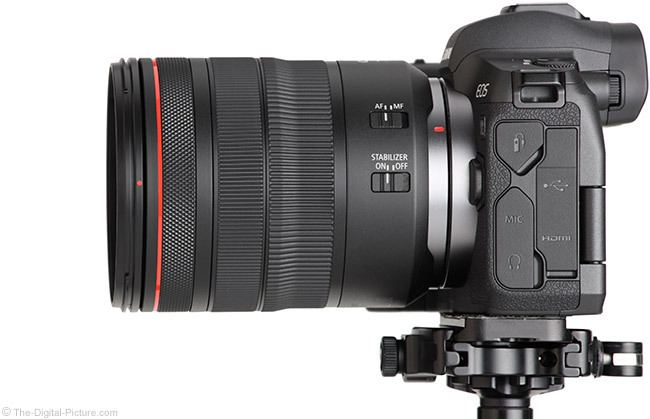 I thought perhaps we would see an LED panel such as the one first included on the Canon EF 70-300mm f/4-5.6 IS II USM Lens. I didn't find the 70-300's panel of great value and apparently Canon determined the same. However, the R-series cameras can show the focus distance in the viewfinder. R-series cameras feature a "Retract lens on power off" feature that is enabled by default. Note that disabling this feature avoids having a carefully-selected focus distance from resetting when camera auto powers off. A nice RF design feature is the external diameter of the lens mount area matching with the camera mount. Along with an aesthetically pleasing appearance, this design makes it easy to align lenses with cameras and some finger space is provided. When the R-series cameras are powered off, the mounted lens' aperture blades are closed farther than the lens' minimum aperture opening, protecting the shutter blades and imaging sensor from damaging light, primarily from the sun. Why was this series of lenses named RF? Good question. 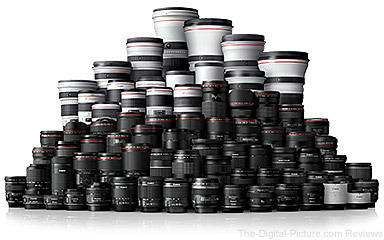 The one guess at an answer I heard from a Canon rep was that the camera was named "R" and there were "EF" lenses before. That explanation sounds logical, but of course, it's only a guess. Along with the first EOS R-series camera, Canon introduced four RF lenses. That three of those four have f/2 or wider apertures (including a game-changing Canon RF 28-70mm f/2L USM Lens) and that three of the four are high-end L Series models shows us that Canon is serious about this mount. My early experience with the R-series camera and RF lenses has been very positive and exciting new lenses are surely coming. Progress often requires change and positive change, though it sometimes involves some pain, can bring great rewards. The pain in this case is relatively modest. Aside from the cost of acquiring an R-series camera, the biggest pain I see is that an adapter is required to retain the EF, TS-E, MP-E and EF-S lens functionality. I'll gladly accept the adapter to have the new technology. "The new RF system design anticipates ongoing innovations in future cameras as well as lenses." 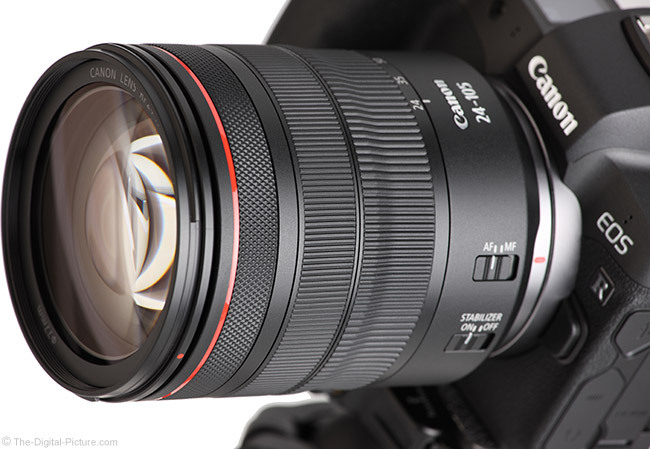 [Canon USA White Paper] Canon has not disclosed what the future holds for the RF lenses, but Canon's designers are quite excited about the opportunities afforded by the new RF lens mount and the freedoms it affords. I'm sure that we are not yet seeing all of its benefits. The future is bright!